The Diamond pattern coffee set was designed by Gio Ponti and introduced in 1958. It is one the most attractive modern design in the market today. This set consist of the following: The Coffee pot has rattan handle insulator, No. 440, weighs 28 toz, 11 1/2"H by 7" W. The Creamer No. 440, weighs 8.3 toz., 4.5"H by 4 3/4" W. The Covered Sugar No. 440,weighs 8.9 toz, 4"H by 4 1/4" W The round Lucite tray has sterling band marked X436, the diameter is 15". All measurements are approximate. 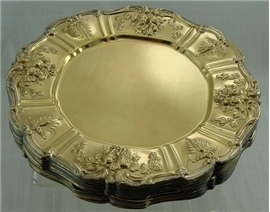 FRANCIS I by Reed and Barton Sterling Silver TEA TRAY, No Mono . 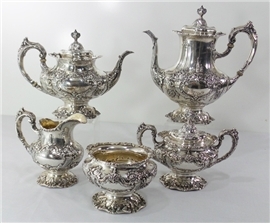 FRANCIS I by Reed and Barton Sterling Silver 5-PC TEA and COFFEE SET, Mono. FABULOUS FRANCIS I FIVE PIECE TEA SET BY REED& BARTON IN VERY GOOD CONDITION COMPRISED OF: LARGE COFFEE POT- H10 3/8", 45 TOZ, 571A, Circa 1950; LARGE TEA POT- H 8", 37.8 TOZ, 570A,��� Circa 1950; COVERED SUGAR-H 6 3/8", 26 TOZ. 570A,�Circa 1951; WASTE BOWL- H 4 1/4", 14.39 TOZ, 570A,�Circa 1949; CREAMER 5 3/4", 14.59 to, 570A,� Circa1951; ALL MEASUREMENTS ARE APPROXIMATE. In Very Good Condition. 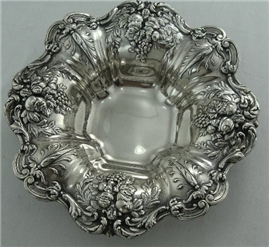 Beautiful sterling silver oval Bread Tray in the ornate Francis I pattern by Reed & Barton. The length is 11 5/8”; the width is 7 5/8”; the weight is 13.42 Troy Oz. The condition is wonderful - no dings, no dents, no problems. There has never been a monogram. The marks on the back are REED & BARTON - STERLING - X554 - FRANCIS I. This is a fabulous pair of 3-armed sterling silver candelabra in the Francis I pattern by Reed & Barton. The height is approximately 14”; the spread is approximately 14”. The condition is excellent - I did not see any problems. Notice that these are “8-way” candelabras. 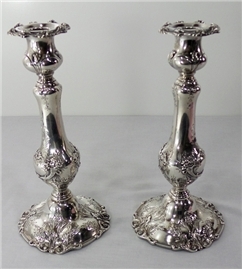 Old pair of Francis I sterling silver candlesticks. The height is 10 3/8". The condition is wonderful; I did notice 1 teeny ding on the underside, near the top of 1 stick - one would have to bend to even see it! The pattern is clear with nice oxidation. Notice that the bases are NOT weighted. There has never been a monogram. One of the stix is marked REED & BARTON - STERLING - FRANCIS I - 570A; the other candlestick is not marked - I am 100% sure that this was an oversight by the company, as both stix are identical and came from the same home in Newport, RI, where they were equally really tarnished!